I am going to cheat a little bit today, because the Surface RT can’t run x86 apps. This means that trying to participate in the LAN party that I’m hosting at my house today is outright impossible using the Surface RT. But I will limit the usage of my desktop purely to video games. No e-mail, no photo editing, no writing, and no Redditing. Okay I lied, I needed to edit a story a bit more before it went up and check my e-mails. Both of these tasks were done on my desktop for two reasons; using full-size peripherals and a large monitor is much more conducive to productivity than a tiny keyboard and small screen, and the built in Windows 8 mail app doesn’t support my POP mail server. Near the middle of the day my phone started going off with an Emergency message from the City, informing me that blizzard conditions were possible within the next 24 hours. 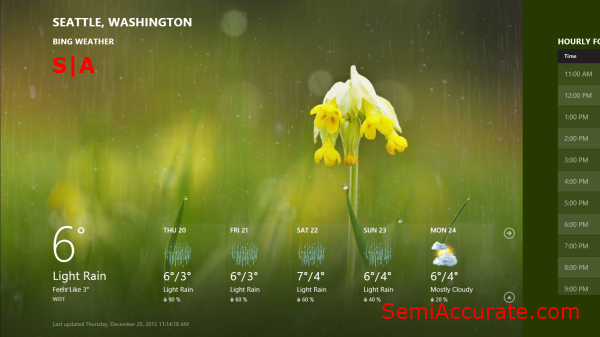 Of course I picked up the trusty Surface RT and used the Bing Weather app to check the forecast. I actually quite like this app because it manages to display a large amount of weather data in a visually appealing way, without making it hard to understand the data. For the rest of the day I did not use the Surface RT, as I was engaged in a gaming session. But when my friends and I drove out to pick up some Pizza, I took the Surface RT along for the car ride. I actually had an enjoyable experience using Microsoft’s Minesweeper app, that is until my friend drove over a pot hole and the Surface RT smacked into my face. It was at that point that I realized that there are some down sides to the sturdiness of this device. But back to the Minesweeper app; the key feature here is Adventure mode. 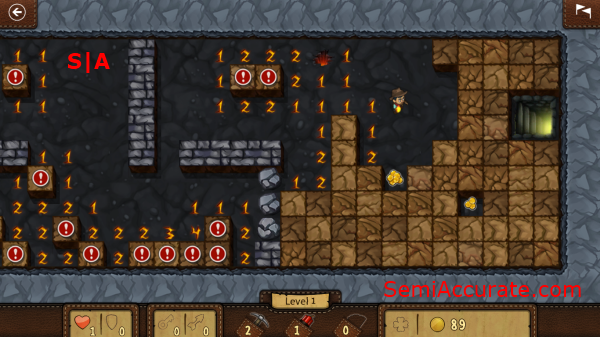 In adventure mode the game is styled after an Indiana Jones movie and the objective of the game is to work your way through large rectangular maps that are on a Minesweeper grid. Along the way you can mark traps (mines), collect gold, keys, tools, and weapons to aid you in your Dungeon crawling adventures. It’s a surprisingly entertaining game type that adds a new twist to an odd game, but I can’t help but feel like I’ve played a browser based flash game that had a similar concept a few years ago. I’m typing this story up on my desktop. I feel a bit bad about this, because I don’t know if I can really do this story justice without immersing myself in the full Surface RT experience. But I’m still not comfortable using the Touch Cover as my keyboard. Sometimes tapping the keys makes letters appear on the screen and sometimes it doesn’t. The only way I know my key strokes are getting through is if I hear a tapping noise emanating from the speakers. But the second you mute the volume, even that audible reassurance that something is getting though goes away. I don’t know if I’m just caught in an outdated mindset that puts too much emphasis on tactile feedback while typing, or if I’m just really choosy about my keyboards; but either way I’m still waiting for the Touch Cover to start growing on me. I used a Twitter app today called MetroTwit. It uses a column style layout and is actually a pretty great app. Granted, it’s a relatively simple app, but it’s an app that for the purposes of reading and writing tweets is very well done. The tweets are easy to read, and the menu system for looking at your mentions and direct messages is easy to understand. The in app ads are a little invasive, if only because their colors don’t mesh well with the rest of the app. But other than that one issue I quite like it, really. 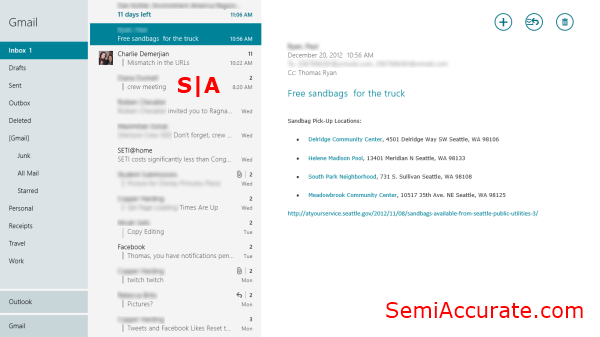 I’ve hooked up my Gmail and Outlook accounts to the Windows 8 mail app now, and I kind of like it. The apps layout makes a lot of sense. As you move to the right of the screen the app transitions from high-level menu options, to a list of your e-mails, and then finally to the e-mail you have currently selected. There are only two things that I don’t like about this app. One, when you start to reply to a message, but then decide you no longer want to, you have to delete the draft e-mail as you exit, rather than just exiting. Also, I still can’t get to my work e-mail because the Mail app doesn’t support POP mail servers. Today I have resolved to write a story on the Surface RT. Oh, AMD released the first non-beta version of CodeXL, I should write that up; to the Touch Cover! Again I find myself confronted with this awkward typing experience. I will give the Touch Cover some credit though, I feel like I’m typing faster when I am using it. But my typing speed is actually the same, and I have a higher error rate to boot. 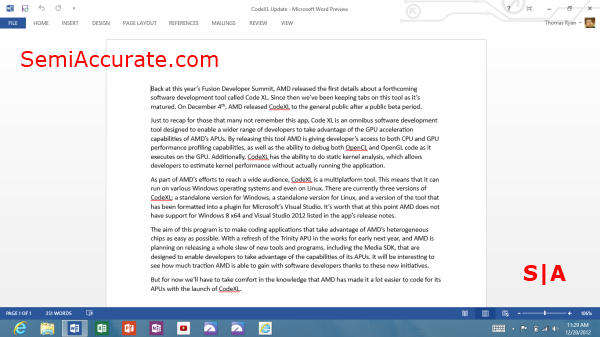 I ended up typing 3/4th of the story on the Surface RT and then uploading the word doc to Skydrive so that I could finish the job on my desktop. I have failed to follow through on this tablet experiment yet again. Part of the reason that I defaulted back to writing stories on my desktop is that using a touch screen interface to crop photos or highlight words is like asking a elephant to tailor your suit. 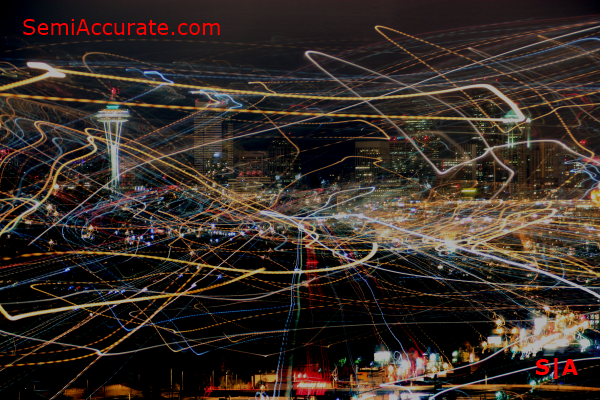 It’s just not a reasonable way to get precise editing results. I handed the Surface RT over to my mother for a few hours to see how an iPad owner would react to this device. As it turns out, she promptly started playing FreeCell on it, and didn’t stop until the battery had dried up. One point for Windows RT! If there is one thing that Microsoft seems to be getting right with Windows RT, it’s the casual gaming apps. The Minesweeper app is excellent, the Solitaire app is good, and even the Sudoku app decent. 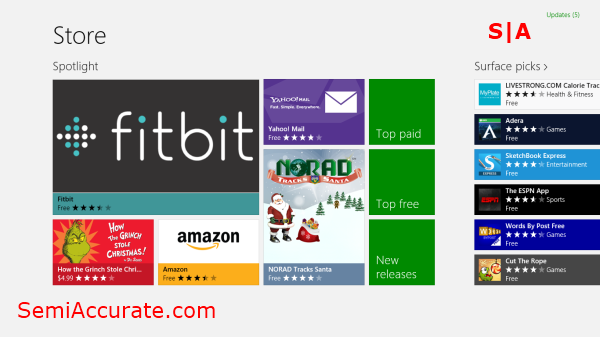 A lot of people don’t like the Windows Store. Critics seem to agree that the store is clunky and makes finding good apps difficult. I would tend to agree with them. The most powerful tool for finding apps in the Windows Store is the Search Charm, unfortunately this Charm is not able to correct the user. 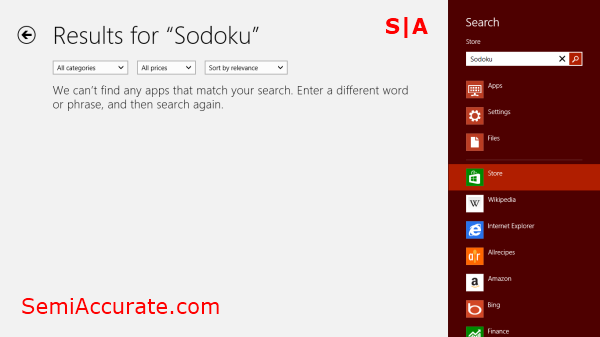 For example if I were to search for “Sodoku” the search would return no results. Thus if I didn’t realize that I had misspelled Sudoku, it would be very easy to feel like I’d hit a dead end and become frustrated. The in-ability of the Windows Store to suggest similar search results, especially in the case of misspelled words, is its biggest weakness. 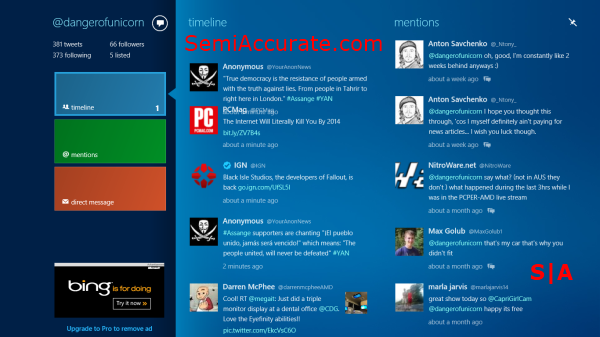 Another thing that a lot of people pick on the Surface RT for is its 16:9 aspect ratio screen. I actually kind of like it. Most of the media content available on the web is formatted for the 16:9 aspect ratio, and having the ability to watch content in its native aspect ratio is quite nice. 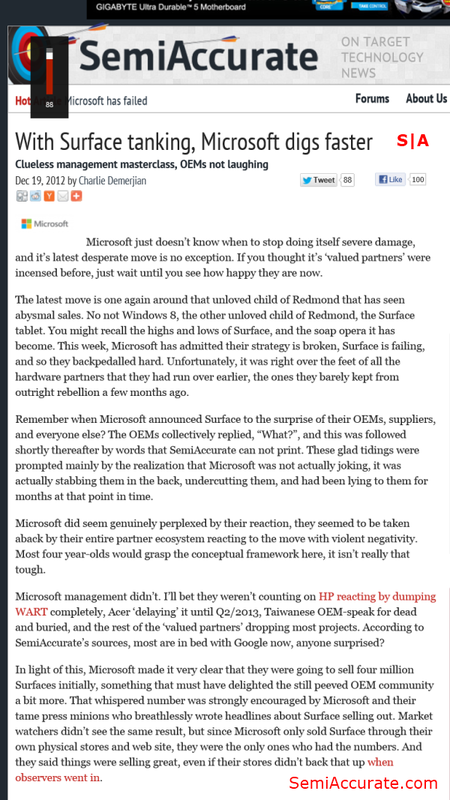 Additionally, reading websites, like SemiAccurate is really easy to do when you rotate the Surface RT into Portrait mode. I for one think that the 16:9 aspect ratio suits Windows 8 really well. I made a video last week that compared the battery life of the Surface RT tablet to the battery life of Acer’s Iconia W510. This comparison was basically a way for me to compare Nvidia’s Tegra 3 chip to Intel’s new Atom Z2670. I’ve read a number of comments that pointed out that I didn’t test either of the tablets with any real game benchmarks. To that end, I spent most of my morning trying to find games in the Window Store that I could benchmark. Unfortunately, I ran into a number of problems. First off the number of games that use 3D rendering via DirectX rather than Canvas rendering through HTML5 is quite small. 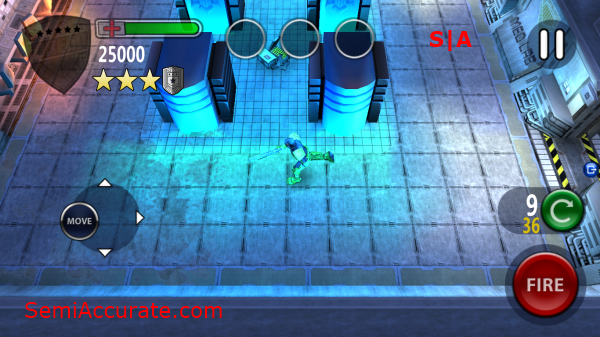 And even when we look only at that small subset of games with 3D objects in them, games like Dredd Vs Zombies or ARMED!, these are still casual games that lack the ability to display their own frame-rates. Normally when anyone wants to record the frame-rate of a game they turn to an app called Fraps. This is a pretty well known, and easy to pirate app, but it’s also a desktop only app written for x86 and x64 Windows installations. The Surface RT is incompatible with Fraps due to it’s use of an ARM SoC and Windows RT. This issue puts reviewers, like myself, in a bit of a bind because now we don’t have an app that can record in-game frame rates. The next best option for recording frame-rates is letting the app itself report it’s own frame-rate, which is an easy enough thing for developers to do. But because the games in the Windows Store are almost all casual games, none of them have the option to enable a frame-rate counter. The only way to get around this road block is to edit the code to add the frame rate counter. But alas, that is not a task we’re up to today. Until the Windows RT ecosystem matures significantly, I’m afraid that there is very little that reviewers will be able to do when it come to measuring game performance other than giving their impressions of game play fluidity and verifying that an app will run without additional coding. I hooked my Facebook account into the Pictures app, and was pleasantly surprised when the app downloaded copies of all of my Facebook photos. Admittedly, the photos didn’t look very good, because Facebook re-sizes photos down to 960 by 720 pixels; and the Surface RT’s display resolution is 1366 by 768, which means that the photos get letter boxed and up-scaled to fit the display. If you compare the quality of the photo that was pulled from Facebook to the original here, it’s pretty clear that a significant amount of quality has been lost. But all the same it’s nice to have access to all of my Facebook photos from the Start screen. 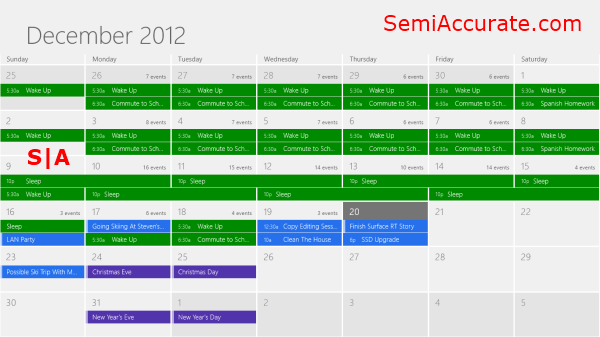 Another app that’s growing on me since I started using it, is the Calendar app. It has a functional, if uninspiring, interface and it can pull data from my Google Calendar to boot. Adding an event is very similar to sending a reply in the e-mail app. You just tap the day and then enter the specifics of the event. I think that Calendar really highlights one of the big problems with the stock Windows apps, they are functional, but at the same-time there is nothing special about them. This morning I resolved to finish up this journal. Up until now this document has been composed purely of text. 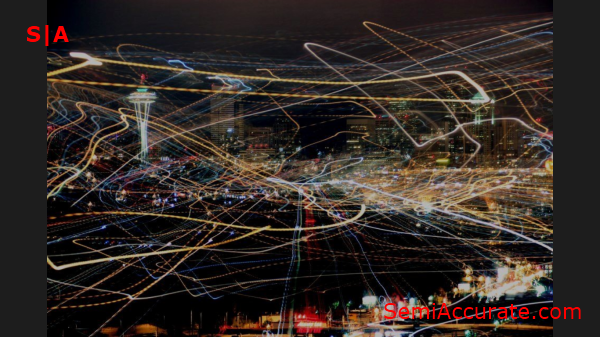 But as you may have noticed, I’ve added quite a few images to the version that you’re reading now. A lot of those images are screenshots. It may seem kind of strange that I’m pointing this out, but there is no print screen key on the Touch Cover. Admittedly, this is a key that only a small number of people will miss, but it’s a key I use quite often, so its absence bothers me. On Windows RT tablets the only way to take a screenshot is to press the volume down button and the Windows button at the same-time. From there I uploaded the screenshots to my Skydrive account so I could edit them on my desktop. Skydrive is actually a very useful app, particularly on the Surface RT, because it’s very easy to start a project while on the go, but it’s much harder to finish a project on tablet like the Surface RT. 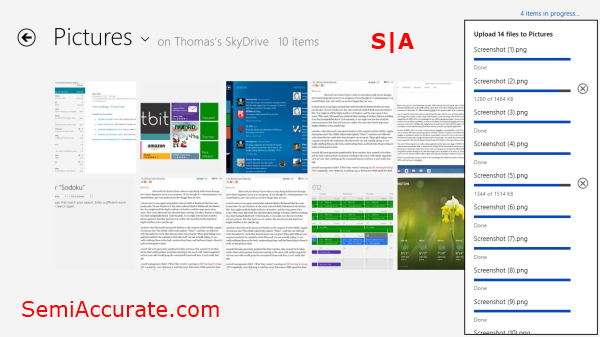 This is where Skydrive comes in, by uploading your files to the cloud so you can easily access them on your desktop. 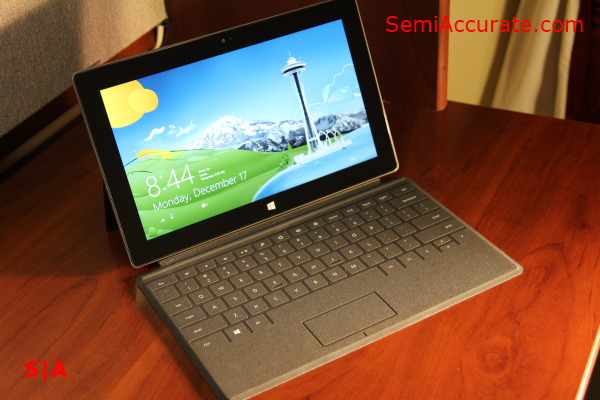 The Surface RT is really the perfect device for showing off all of the limitations of the ten inch tablet form-factor. Touch just cannot compete with the precision of a mouse, or a good track-pad. Trying to place the cursor in the middle of a word to correct a spelling mistake in Word 2013 using touch is like trying to play Operation with a Coke can rather than a pair of tweezers. Touch is just not precise enough to ever completely replace the mouse. Another issue is the keyboards that these tablets get saddled with. I have yet to use a ten inch keyboard that didn’t remind me of how lucky I am to have a full-size desktop keyboard, and a lovely Thinkpad keyboard on my laptop. At best ten inch keyboards are mediocre like the Touch Cover or the Acer Iconia W510’s keyboard dock, and at worst they are near perfect copies of the MacBook Air’s keyboard. The Surface RT is a good device for the form-factor that it occupies, but I really think that it’s form-factor is it biggest drawback. It’s not small enough to replace an e-reader or a hardcover book, and it’s not large enough to be useful for getting work done efficiently. It just occupies this weird middle ground where it’s not a good device for typing and it’s not a good device for tasks that require the precision a mouse offers. It’s only real use is as an additive device that, more often then not, you’re handing off to someone in the 16 and under age group to play Cut the Rope on. AMD says goodbye to their VISION branding?